The PAN Foundation today opened a new patient assistance program for people living with carcinoid syndrome. Carcinoid syndrome occurs when an underlying carcinoid tumor produces excessive amounts of serotonin, often due to liver metastases. Carcinoid tumors are rare. The National Organization for Rare Disorders estimates 27 new cases per one million people are diagnosed in the U.S. each year—of which 10 percent develop into carcinoid syndrome. Qualifying patients are eligible to receive grants from PAN to pay for the deductibles, co-pays and coinsurance costs associated with their carcinoid syndrome treatment. Patients who qualify for the PAN Foundation’s Carcinoid Syndrome Assistance Program are eligible to receive $6,700 per year in financial assistance. 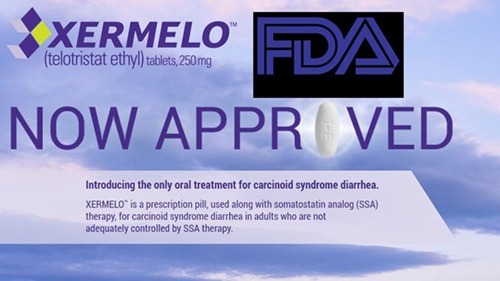 Eligible patients must be getting treatment for carcinoid syndrome; must reside and receive treatment in the United States; must have Medicare health insurance; and the medication for which they seek assistance must be covered by their insurance and listed on PAN’s list of covered medications. In addition, patients’ income must fall at or below 500 percent of the Federal Poverty Level. 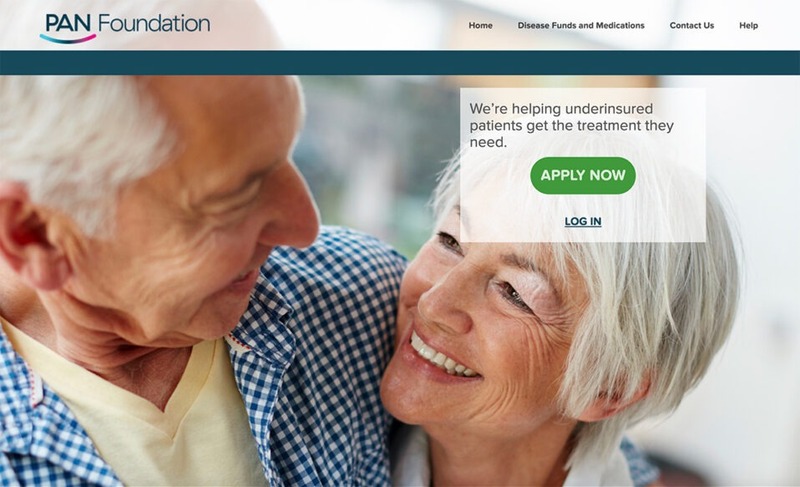 Patients, or advocates and caregivers applying on their behalf, can apply for assistance using the PAN Foundation’s online patient portal (www.panapply.org), or by calling 1-866-316-7263, 9 a.m. to 7 p.m. Eastern Time, Monday through Friday. To learn more about PAN’s nearly 70 disease-specific programs, visit panfoundation.org. 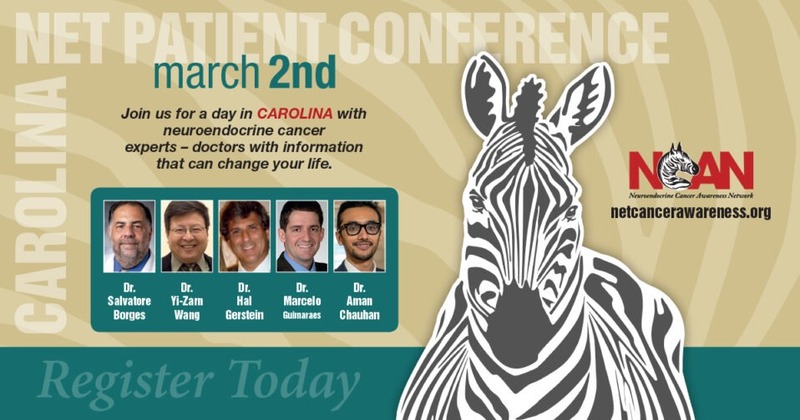 Please join us Saturday, March 2nd, 2019 for the not-to-be-missed Carolina Neuroendocrine Cancer Patient Conference in Charleston. 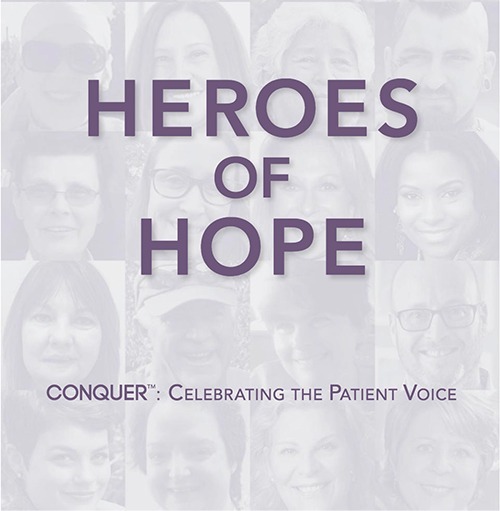 Dr. Salvadore Borges, Dr. Yi-Zarn Wang, Dr. Hal Gerstein and other experts will be there to give you the information you need to make sure you get the best treatment possible in your fight against neuroendocrine cancer. NCAN on Happy Sunday Morning LIVE! 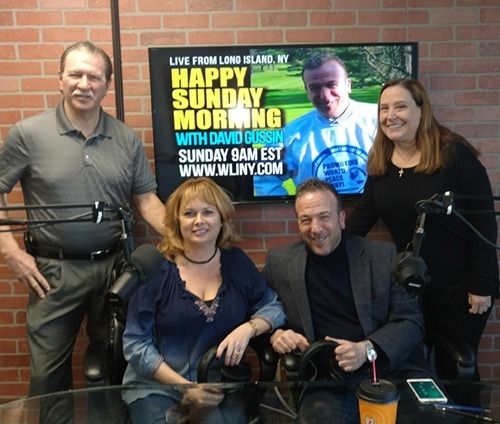 Maryann and Bob Wahmann of NCAN made a live appearance on WLINY Studios LIVE show Happy Sunday Morning with David Gussin to discuss Neuroendocrine Cancer, NCAN, and many upcoming projects and events coming in the NET community! 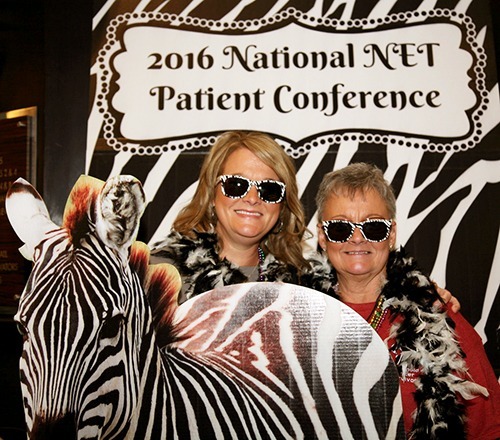 They also discussed the REAL reason behind choosing the zebra to represent Neuroendocrine Cancers! NCAN would like to send a BIG Thank You to David Gussin and WLINY Studios LIVE for helping spread awareness of Neuroendocrine Cancers and helping NCAN spread the word of our mission! 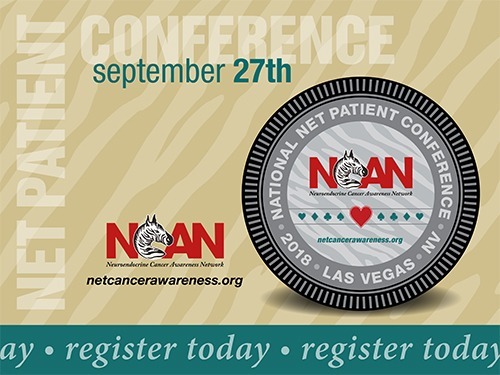 NCAN’s 2018 National NET Patient Conference will be in Las Vegas, Nevada, Thursday, September 27th through Saturday, September 29th, 2018. All events will be held at the Green Valley Ranch. You can check out the Green Valley Ranch here. Keep your eyes out for all the information to come in the next few months as we prepare to open registration January 2018! We look forward to sharing another great National NET Patient Conference with top doctors giving us the most up-to-date information on NET Cancer!